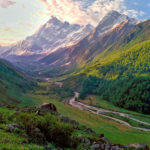 Sandhan Valley, also known as Valley Valley of Shadow, is one of the grandest canyons found in the splendid setting of the Western Ghats of Indian Subcontinent . 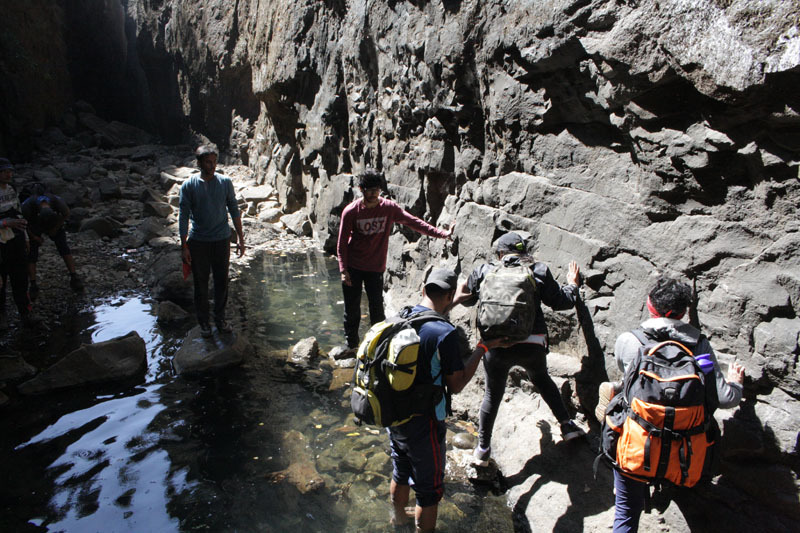 The valley is located on the western side of the magnificently beautiful Bhandardara region, of Samrad village .Being surrounded with mighty Alang, Madan and Kulang ranges ,Sandhan Valley trek is among the toughest and most sought out treks in Western ghats. 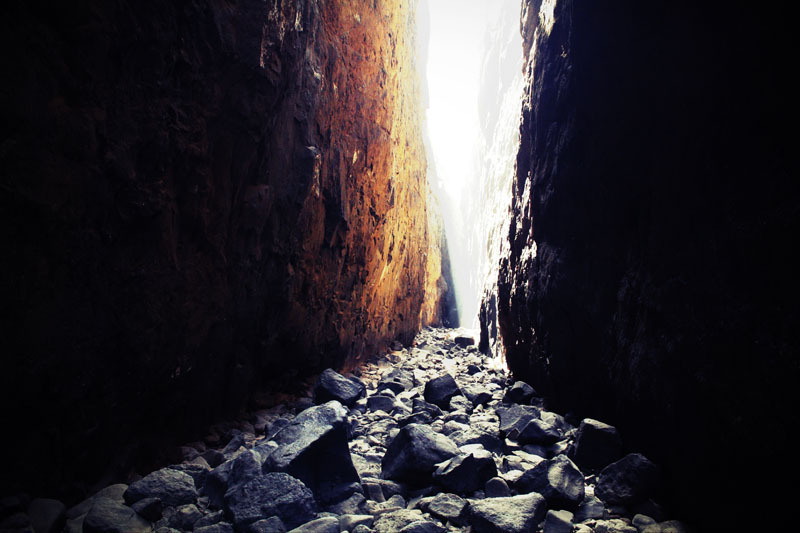 This brilliant and sheer deep narrow rock floored ravine valley is located between the two high walls of mountain range. 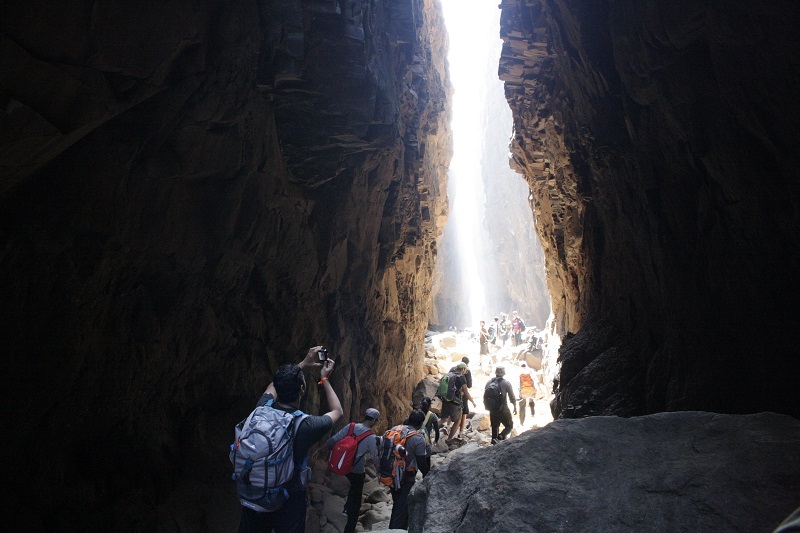 It’s chiseled valley is around 200 ft deep and is said to be around 2 km long. The valley is so narrow in some places that Sun rays find it difficult to reach its base ,which gives it the name-valley of shadows. 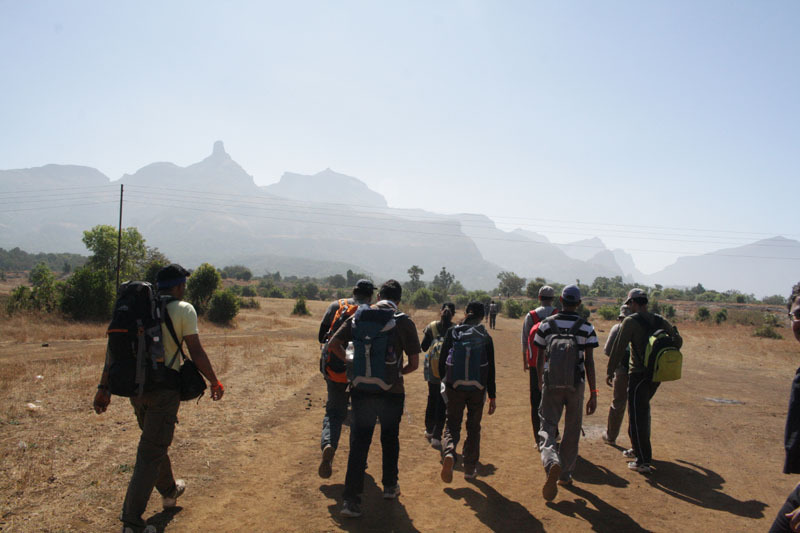 The Sandhan Valley trek starts from a beautiful Samrad Village in the Ahmednagar district . Samrad Village is 200-250 kms away from Mumbai/Pune . 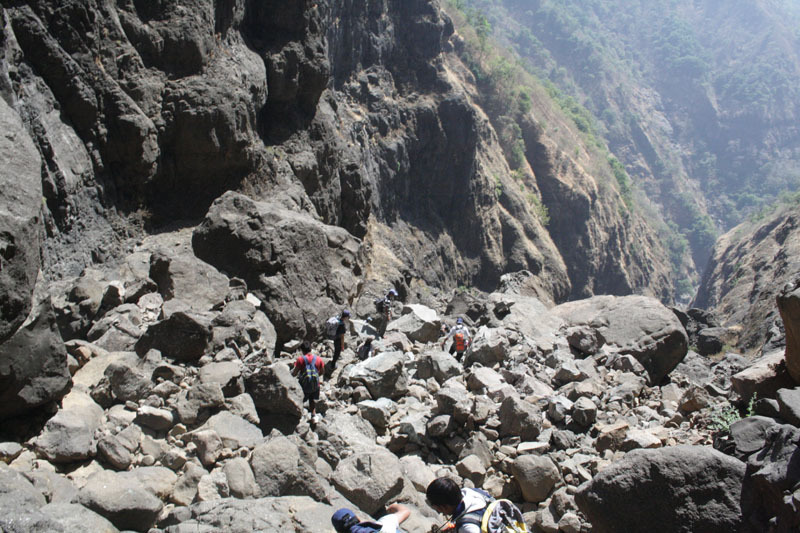 And the total time it takes to complete this trek is around five hours, which also includes rappelling and crossing pools of water.Basic fooding and lodging facilities are available in Samrad village which can be pre booked before leaving for the trek. 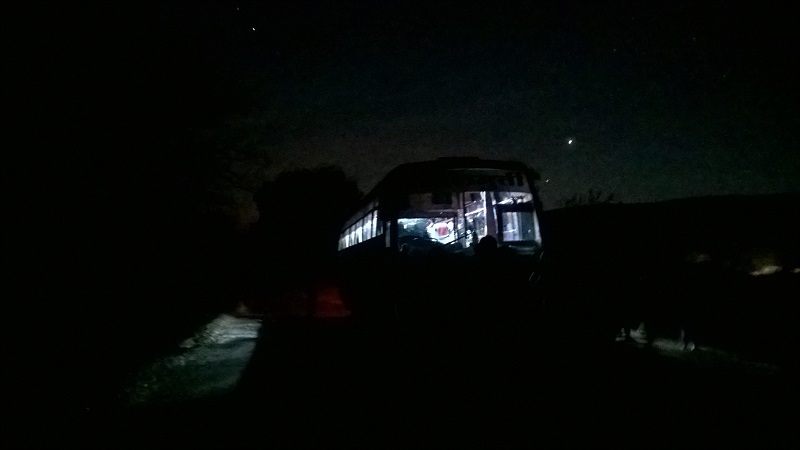 Night Bus trip to reach Samrad, The starting point of the trek. The trek start with a flat land and with gradual descent goes down to a valley . The valley has few deep pools to swim across initially and so it is advisable to have some extra dry clothing and a dry bag to be carried with you . 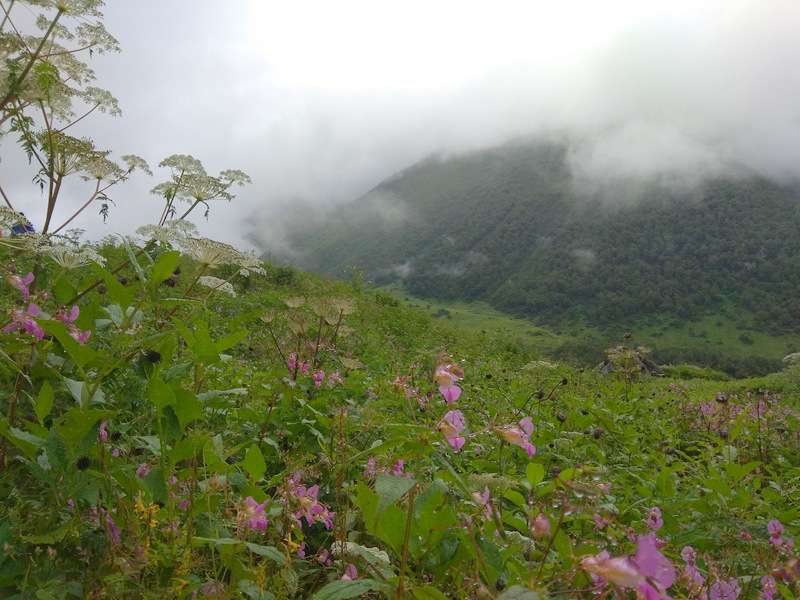 After 15min of brisk walking ,the mountainous valley, covered on two sides by hills, further leads deep into the valley where its gets really dark and damp cold. 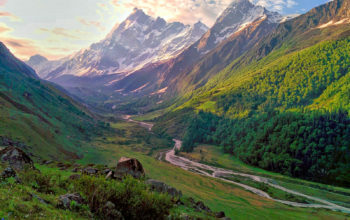 The valley opens up a bit and one can gauge the vast expanse of Sandhan valley ahead. Valley opening up further while descending . The further descend is not an easy walk. Throughout the length of the valley one will encounter varying sizes of boulders ,which will need to be tackled so as to proceed ahead. 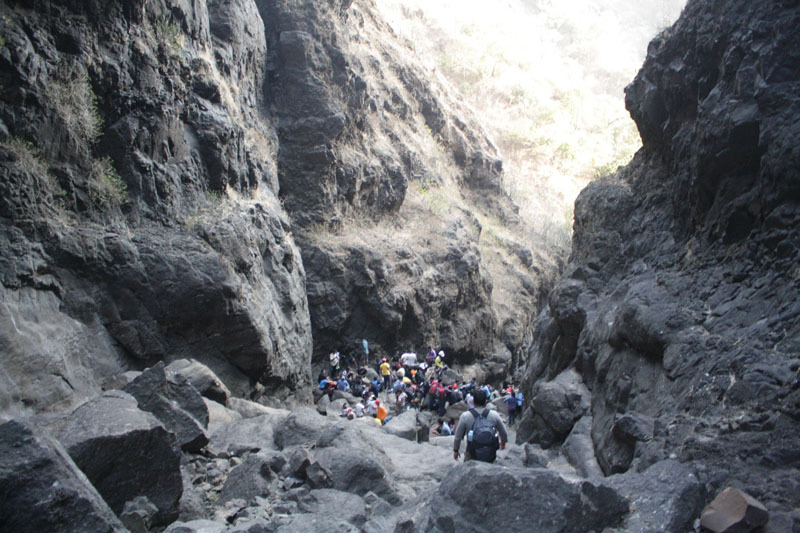 Completing the trek will seem to be more like solving a boulder puzzle. 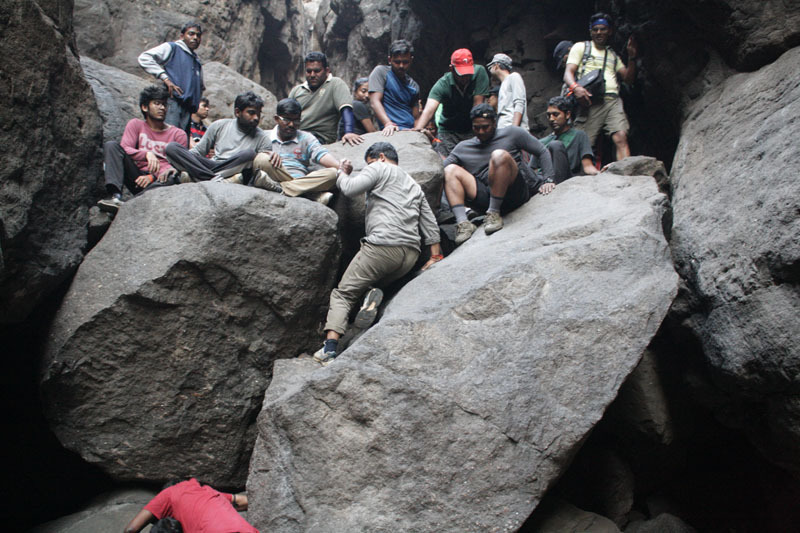 After few more hours, one will reached the first rocky patch where the valley seems to end .There’s a deep gorge thereafter and path further down seems to have vanished .So to reach to the lower reaches the trekker will have to rappel down using fixed ropes. 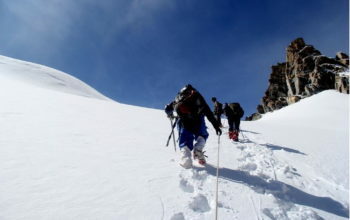 This feat cannot be done without some technical assistance of certified professionals .Since there are more than two patches – one 45 fts and other two of 15 fts where you have to rappel down using ropes the trekkers will definitely require assistance .This is also a high point on this trek which adds more thrill to it . 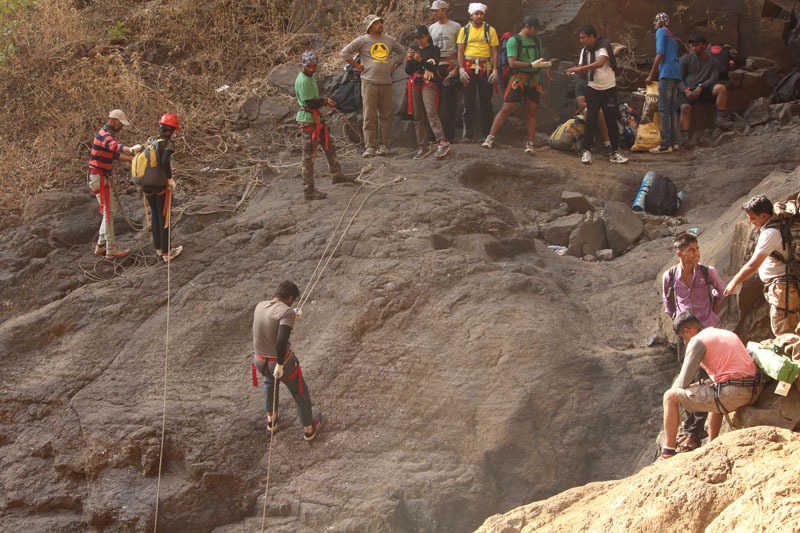 1st Rappelling Point to reach the bottom point of rappelling point 60 fts. 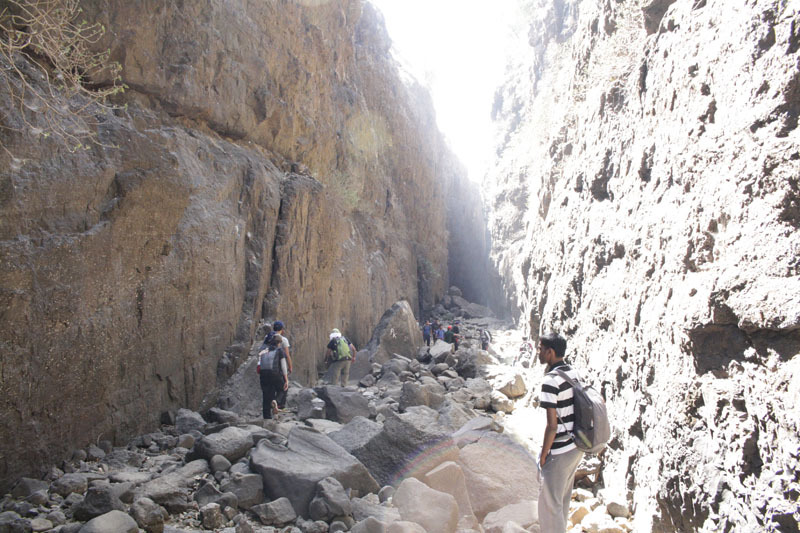 From the valley’s lowest point it takes the next 10 -15 minutes, to reach the base camp . Walking through the narrow valley with 300 ft rock walls on both the sides was, once in a lifetime experience. It was one of a memorable experience and the overnight stay under the pollution free night sky, right besides a huge water reservoir was a sweet cherry on the cake !! 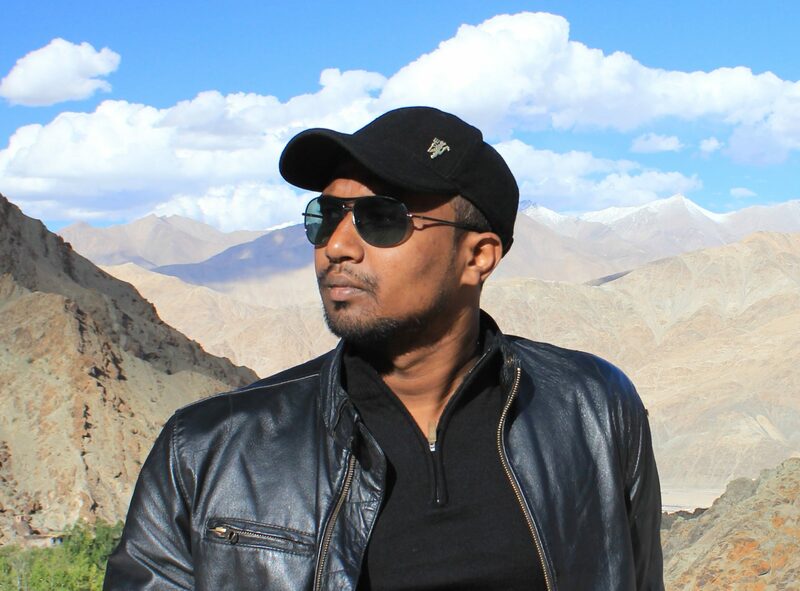 Sandhan Valley lies in an not so easy to reach region and getting to it via road might seems tricky. 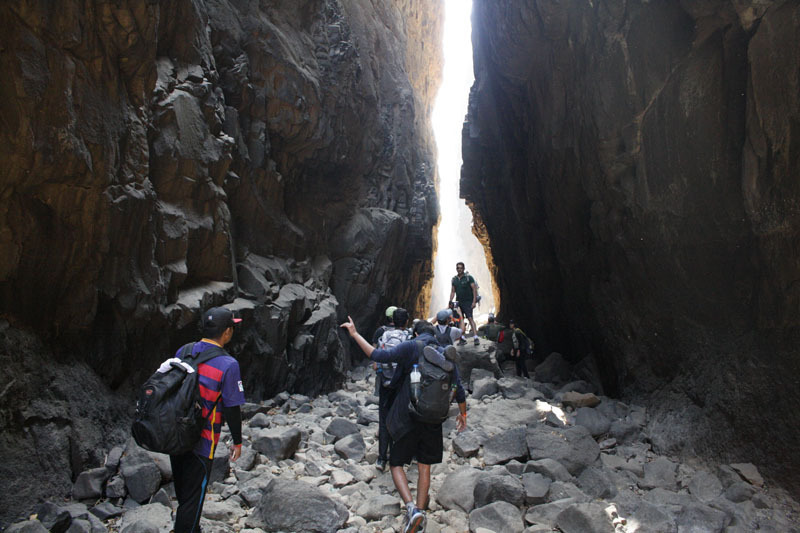 The nearest village to Sandhan Valley is Samrad village of Ahmednagar district ,which serves as the base for the Sandhan valley trek. 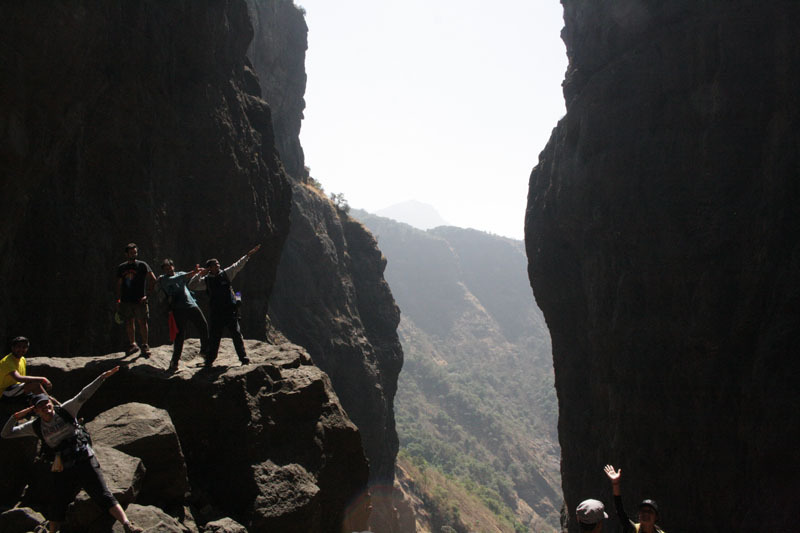 FROM MUMBAI – By road, the best way to reach Samrad village from Mumbai is via Igatpuri. Renting a private vehicle that takes you all the way to Samrad would be the most convenient option. 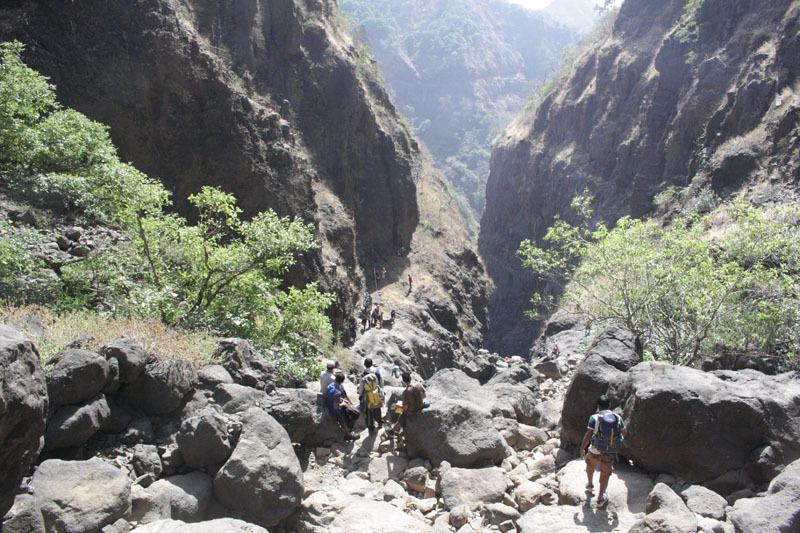 .Ideal route taken is from Kalyan – Kasara – Igatpuri – Bhandardara Road – Vasali Phata – Varaghushi Phata – Shendi Bhandardara – Udhawne – Ghatghar Dam – Samrad village. Total Distance is near to 200 kms . 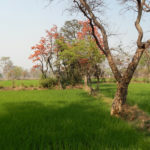 FROM PUNE – The distance of Sandhan valley from Pune is around 250 kms .And the ideal route is Pune – Chakan – Rajgurunagar – Alephata – Kotul – Bhandardara – Samrad. 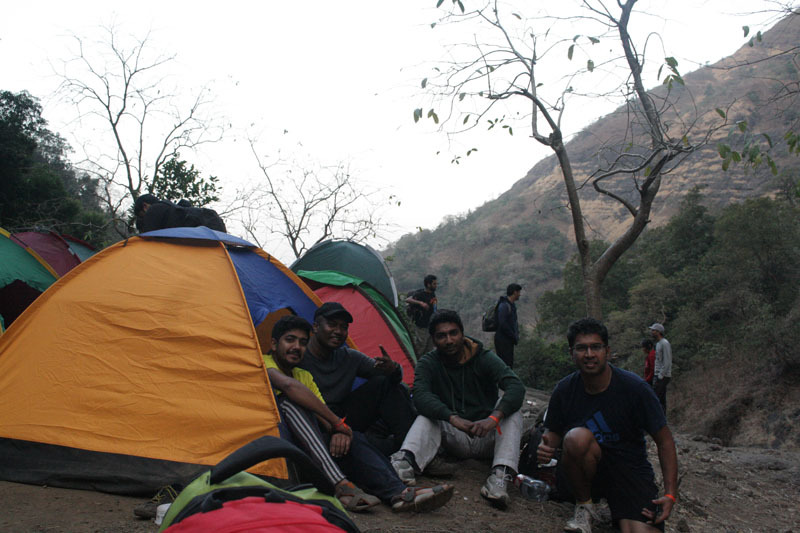 The months of November till February are ideally the best time to do the Sandhan Valley trek . The months of monsoon from Jun to late August fills up the valley with water and so it remains closed for any trekking activities .